N is an integer and is the input to the flowchart. 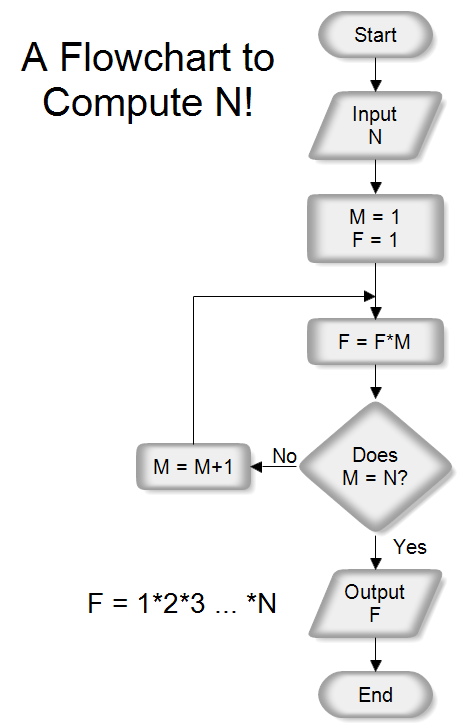 This flowchart has a loop that starts with M = 1 and increments M until M equals the inputted value N. This program calculates N! by doing each multiplication. Since a computer can rapidly do calculations, it can implement a brute force solution rather than having to rely on a more elegant one. The next question might be "Can you find a function that computes N! from N without doing each multiplication?" Once RFFlow is installed, you can open the above chart in RFFlow by clicking on n_factorial_flowchart.flo. From there you can zoom in, edit, and print this sample chart. It is often easier to modify an existing chart than to draw it from scratch. To draw this chart without downloading it, run RFFlow and click on the More Shapes button. Scroll to the Flowcharting folder and click the plus sign to open it. Click the Colored Edge Shapes stencil and then click the Add Stencil button.